Root canal treatment is a speciliast endodontic treatment recommended when the root of the tooth becomes infected through tooth decay or damaged by an injury to your mouth. 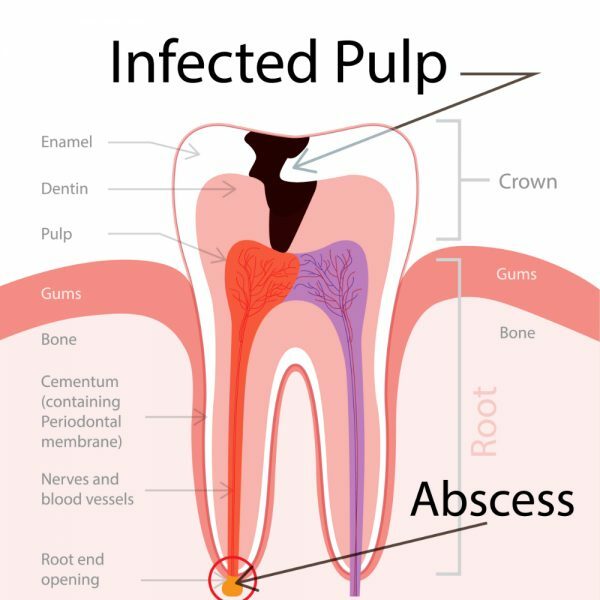 This infection can spread through the root canal systems, including the nerves which carry the blood supply in the tooth. If the nerves become infected they will die and in turn so will the tooth. Once there is no blood supply to the tooth, it is at more risk of infection. This can lead to severe discomfort and abscess. If a root canal treatment is not carried out, the tooth may need to be taken out. The early stages of root problems tend to go unnoticed that is why we actively encourage patients to do their regular check-up and ensure their is no hidden problem that can cause further and much more advanced issues. How do I know if I need the treatment? The root canal treatment might be performed if patients are experiencing pain or any discomfort in the pulp (the soft tissue of the tooth). If the pulp, which is made of nerves, blood vessels and tissues, is damaged you will need root canal treatment. As we have a specialist endodontist in-house, often patients are referred to us and are already aware of their existent root canal issue. There are various symptoms linked to potential root canal complications, such as, but not limited to continuous sensitivity to hot and cold or/and pain when chewing and biting. Our specialist endodontist performs a root canal treatment to stop the infection from spreading and will preserve as much of your tooth as possible. The endodontist uses the latest techniques and advanced equipment such as Waterlase laser and microscope. You will receive a local anaesthetic to ensure you do not feel pain or discomfort. The root is then cleaned and filled to prevent any further infection. A temporary filling is put in and the tooth is left to settle. The tooth is checked at a later visit and when all the infection has cleared out, the tooth is permanently filled. The root canal treatment is a skilled and time-consuming procedure and most courses of treatment will involve two or more visits. On average, the root canal takes about 2 hours per tooth. For nervous patient we provide sedation, yet your specialist will also assist to ensure you are calm and informed throughout your treatment. Depending on your case the weakened tooth can be strengthened with the placement of a porcelain crown or a veneer.